Coyotes spend a great deal of time playing, which includes horsing around, teasing and bantering. These are extremely social and family minded animals: they are constantly interacting with each other. These two are wild urban coyotes in one of the public parks right in San Francisco, one of the 10 densest urban centers in the country. They are behaving like any of the rest of us might towards a much loved parent! Here, in the top photo, an adult yearling daughter has just “hopped on Pop”, actually draping her entire body over his like a wet rag! While on top of him, she gave little playful nibbles to his elbows and knees and then she slid off! She ran off to wrestle energetically with her brother, but within a few minutes she returned to Dad and placed, this time, just a paw on his back, bottom photo, and again, playfully and affectionately nibbled at his elbows, teasing him a little! She’s the only one in this family of three that puts her paws — or even more of herself — on top of anyone else. She is the only female in this family pack. Hmmm. I’m wondering if she has special status due to this, or if she just happens to be the most demonstrative of the group? 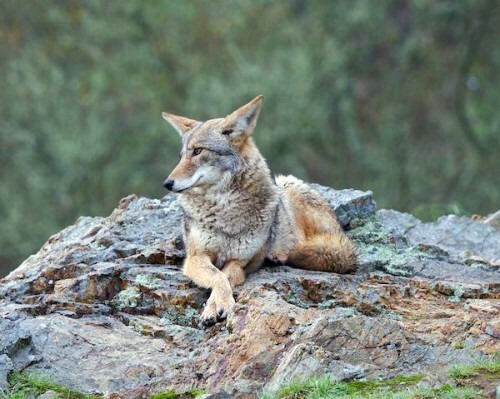 The coyote behaviors that I’ve watched and been writing about revolve around single coyote families — almost exclusively. The one exception has been when an intruder was driven out of a territory. We may have found another exception! Last night we heard the first concrete evidence that interactions outside the nuclear family actually do take place! Background: I’ve been recording the howls of all the coyotes I know. Those I hear regularly I have pretty much learned to distinguish from the other members of their families. Human voices are different and we can distinguish them — each person has a signature voice which is uniquely his own. 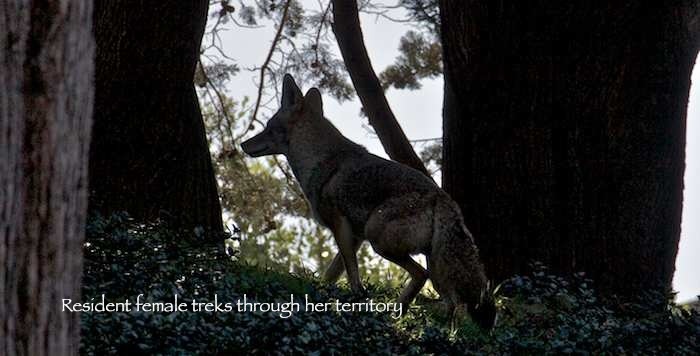 Coyotes, too, have individual voices which can be distinguished once you get to know them. 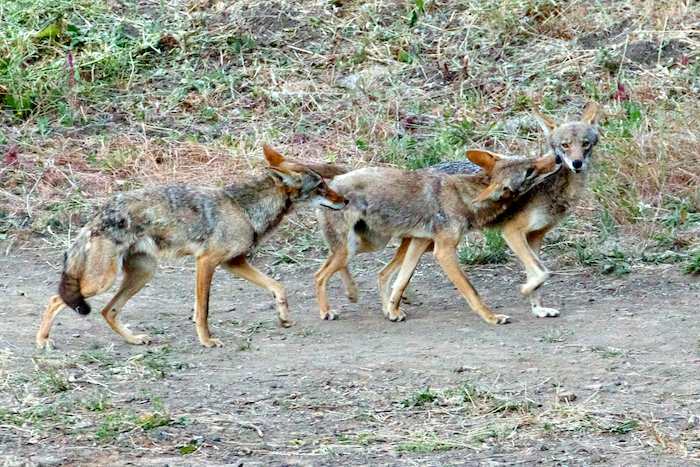 One of my coyote families regularly treks the mile from their “home base” to another open space. I’ve followed them and observed them in the distant open space, particularly during the darkest hours of the night. 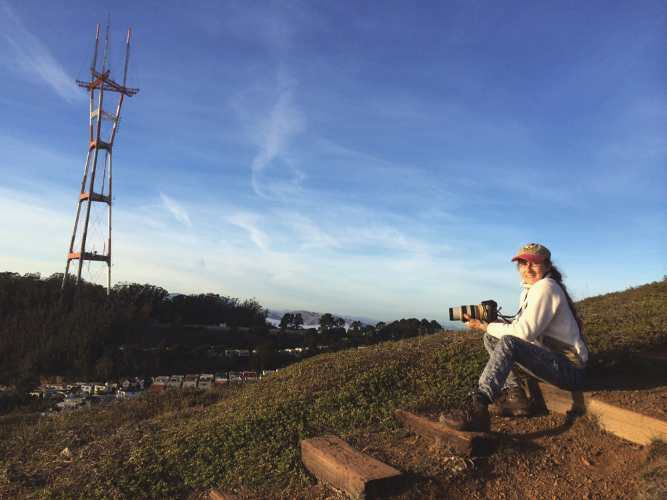 Fellow coyote enthusiast, Jo, lives on the edge of this distant open space. Not only that, Jo has the extraordinary luck of having a back yard which appears to be a cross-roads for coyotes. She has been seeing coyotes which, although she cannot distinguish between, she’s been sending me recordings of their howls regularly and can distinguish some of the howls. The howls seem to confirm what I have been seeing: that it’s the same coyote family members from another open space who frequent that area. Jo has just sent two new midnight yipping and howling recordings, taken only six minutes apart. The first sounded with the voices I am familiar with. However, the second one has a voice I don’t recognize — it’s a totally new voice to me. 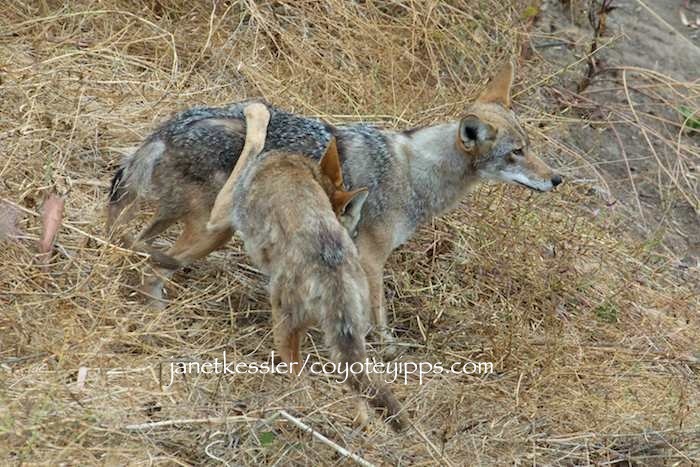 I’ve often been told that one is more likely to “hear” a coyote than “see” one, and that happened to be the case here. So, although I myself have not seen a new face in the area as of yet, I have heard its howl. We don’t know if the communication with the newcomer was antagonistic or friendly. More than likely it was not friendly since newcomers are never welcome and may, in fact, be vying for that piece of territory. 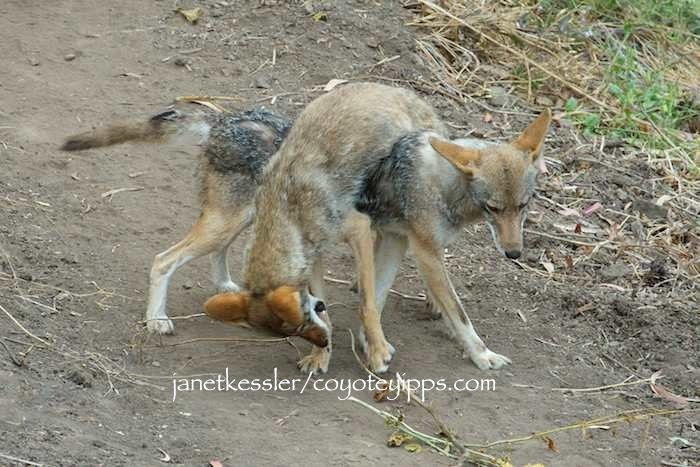 I have been seeing some fight wounds and limping in the resident coyotes which might indicate a territorial dispute. 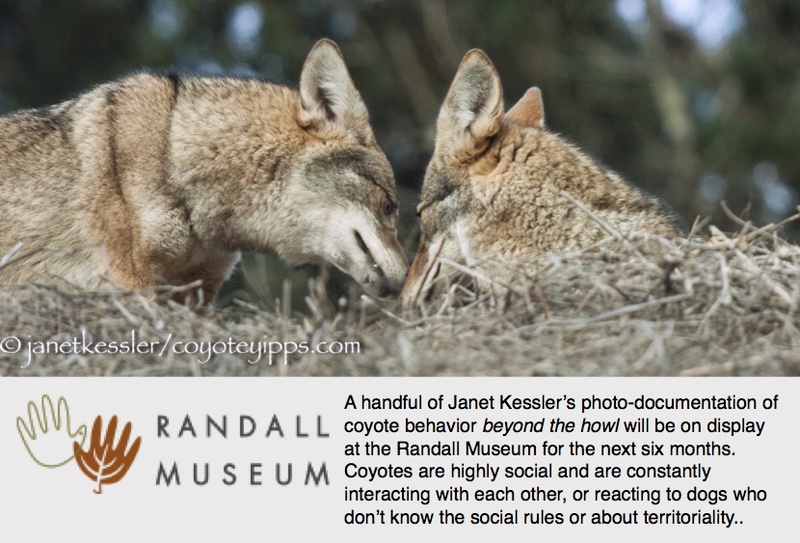 However, I’ve been speculating for some time that coyote social interactions might extend beyond the nuclear family, based on my observation that the female alpha from one of my groups is absent from her home base on a regular basis for a few days at a time, as are the other family members from that family, but less frequently. My thought is that the alpha female regularly visits her dispersed grown pups from previous litters, and then returns to her own territorial home base. AND that the alpha female may even remain the “matriarch” over these particular dispersed individuals. This is pure speculation, but I wanted to toss it out there as food for thought.